A Speedo backpack makes a great holiday gift. What do you get that swimmer in your life for the upcoming holiday season? If they’re like most competitive swimmers, they likely already have a lot of swim gear, as well as swim-related gifts they don’t know what to do with. 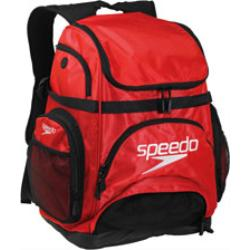 As you look for the perfect holiday gifts for swimmers, Speedo backpacks can be the perfect solution, especially for someone who may be difficult to shop for. The good news is, when it comes to competitive swimming gear, a swim backpack is something every swimmer needs. With all the gear they must carry between meets and practices. Even if the swimmer in your life already has one, it will eventually wear out and they will need a new one. They may even enjoy having one for practices and one for meets. If you try to buy clothing or even competitive swimwear for the swimmer in your life, it can be difficult to ensure you get the right size. This is especially true with swimwear. However, when you purchase the Speedo backpack, it is a one-size-fits-all solution. Swimmers will have all the space they need to keep their swimwear, a towel and all the gear they need to train and swim their best. The best part about swim backpacks is the way they are designed. For instance, the Speedo backpack is filled with pockets for everything you need to carry, including wet pockets for storing your swimsuit and towel when you’re done and ready to head home. You will find the perfect storage space for your swim goggles, swim cap and even your MP3 player so you always have just what you need within easy reach. Looking for holiday gifts for swimmers can be a difficult process, especially if they seem to have everything they need. Competitive swimming equipment from D & J Sports can be the perfect option for competitive swimmers on all skill levels. Of all the available equipment, however, the Speedo backpack can be the perfect option, even for the swimmer who seems to have it all. If you’re looking for competitive swimming gear in Dallas, Texas, contact us. We can help you choose the perfect gift for any swimming in your life. 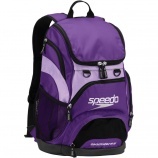 The Speedo Teamster backpack is perfect for swimmers. Everyone knows a good backpack is essential to carry all of your school work back and forth. However, a good Speedo backpack is part of the competitive swimming gear you should also own if you’re involved in swimming. Carrying your swimsuit and other swim gear around in a regular bag isn’t productive, especially once they’re wet. Instead, buying the Speedo Teamster backpack or another similar choice can be a great option. This backpack is designed with swimming in mind and can provide all the advantages you need. As a swimmer, there’s a lot of gear you have to carry around on a regular basis. You’ll need to bring along your swimsuit, swim cap, goggles and towel, of course, but there’s more than that. You should also bring along your favorite chlorine shampoo and conditioner, any swim training gear you use on a regular basis and an extra set of your essential equipment, just in case. This means you need a lot of storage space. Choosing a swim backpack ensures you can always carry exactly what you need and never have to go without. This piece of competitive swimming equipment is ideal for swimmers to keep everything they need close at hand. It includes a removable “dirty” bag to keep dirty or wet swimsuits away from everything else that’s in your bag. There’s also a raised laptop sleeve so you can keep your electronics safe and secure. With plenty of room for all of your gear, you will find it’s never been easier to pack everything you need without having to leave anything behind or carry an extra bag. In addition to the space, these bags are made from durable material and come with a removable bleacher cushion so you can sit comfortably wherever you go. When you’re spending time at the pool, you need to make sure you have all of your swim gear with you to ensure you can train properly without missing a beat. However, no ordinary backpack will hold up to a swimmer’s needs than a Speedo backpack. This competitive swimming gear in Dallas, Texas, will give you all the space you need, made from a durable material that comes in a variety of colors to match your sense of style or your preferences. If you’re looking for the right competitive swimming equipment, contact us. D&J Sports carries everything you need to help you swim your best.